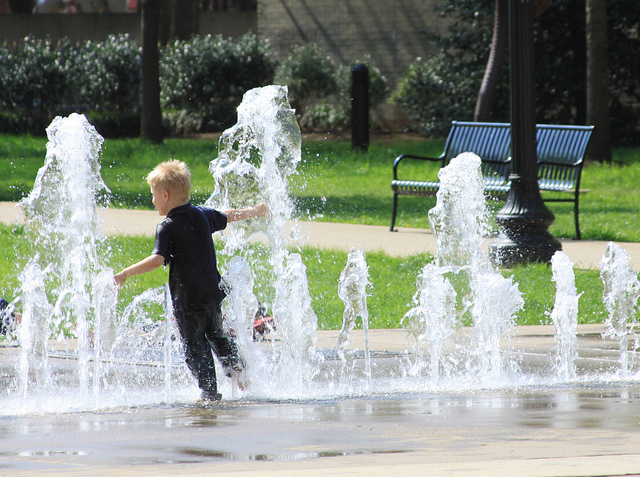 Mini-fountains, like the ones in Knoxville, Tenn., could be a great addition to streets in the summertime. Photo by Wyoming_Jackrabbit. Sustrans, a sustainable transport charity based out of the United Kingdom, launched a competition for primary and secondary level students to design their “dream street.” Open to 7- to 14-year-olds, the competition is hoping to find what U.K. children would like to see on the streets, in addition to what features would make it easier and safer for them to get around on foot and by bike. The competition will be open until October 31 and the entrants will be critiqued by Wayne Hemingway, Sustrans’ patron and co-founder of Hemingway Design, an urban redevelopment agency; Alan Pendlewood, CEO of Pendlewood, the manufacturer that will provide the competition winner with eco-designed outdoor furniture; and Alex Allen, the director of Sustrans’ Liveable Neighbourhoods projects. For more information on the competition, visit Sustrans. Download the entry sheet here. Now is the perfect time to include children in the urban planning process. According to the Guardian, more than 1,100 London schools are near roads carrying 10,000 or more vehicles per day, which could be responsible for up to 30 percent of all new cases of asthma in children. Worldwide, children and young people are the most at risk on the road: Road traffic crashes are the number one cause of death among people aged 10-24 years. If children were presented with the option, would they choose design concepts that remove cars from the road? The U.K. is not alone in seeking children’s opinions in designing urban spaces. A carousel planned for Boston’s downtown area also sought the feedback of children from four city schools who chose unconventional figures like lobsters and butterflies in place of traditional galloping horses. Although it’s an exciting new feature in the city, the carousel is drawing some criticism from experts. According to Roland Hopkins, an editor for the California-based Carousel News & Trader, the city should have considered an antique carousel to better fit with Boston’s historic buildings. Other critics think the money can be put to better use by improving gardens and parks. Ask your inner child: What would you change about your streets?